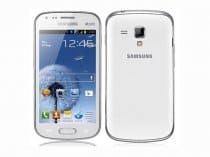 Galaxy Y Duos and Galaxy S Duos were launched by the famous company Samsung in India. As for the international market, Samsung has announced both smart phones as the Galaxy Pocket Duos S5302 and Galaxy S Duos S7562. It does not present with the SuperAMOLED screen of its original; instead, it has a regular LCD screen. The price of Samsung Galaxy S Duos is about €256 or Rs. 17900. In Europe, its price should be almost the same. It is to be noticed that the price of Samsung Galaxy S Duos is almost the same with its “rival”, HTC Desire V.
IPhone 5, claimed by Samsung!